The great American conundrum of food and nutrition is balancing the quality of what we eat with the weekly budget, but the fact is; there are options. Indianapolis is home to a variety of CSAs and co-ops which make eating better, well...better. Often these options are more affordable and certainly the food is closer to home. Co-ops, or cooperatives, are food production groups which are locally-owned and monitored by the people who shop and work there. Specifically, food co-ops in Indy are small grocery stores which usually provide organic and natural food in season. These stores establish relationships with nearby farms to supply various products such as dairy, meat, and produce. Many co-ops expect their consumers to support their cooperative by becoming members. With a CSA people can basically buy “shares” of whatever is grown on a piece of land. This can be just produce or it can extend to meats, eggs and dairy, depending on the organization. CSA’s are similar but are a little more one-to-one between you and the farm and often - there is a little less selection, i.e. whatever the farm plants and is in season will be in your weekly “share”. Essentially a co-op brings a bunch of local farms into one location, where you can pick and choose and a CSA is just partnering with a single farm. Named for the Indianapolis Waterway, Pogue’s Run Grocer is the first community-owned grocery store of the Indy Food Cooperative, Inc. Opened in December 2010, the grocery store is available to the public. However, should you decide to be a member of the food co-op, you can enjoy a number of benefits such as discounts and freebies monthly. The store offers a wide selection of locally-produced, fresh, organic, and in-season produce and products at affordable prices. It carries meats, dairy, bulk items, prepared food items, health and beauty products, pet products, paper goods, and selected conventional brands and products. This food co-op is located at 2236 East 10th street, Indy. For more details, check out www.indyfoodcoop.org. Since 1992, Nature’s Market has lived with the principle “helping you take care of yourself”. The grocery store specializes in providing vitamins, supplements, natural and whole foods. It provides frozen and dairy products, organic and natural produce and meats. It also offers groceries such as beauty care products, aromatherapy, homeopathy, books, CDs and DVDs, and household products. The store also provides services such as massage therapy and neuromuscular chiropractic therapy. This food co-op is located in 2424 Lake Circle Dive, Northwest Indy. For more details, check out natures-market.com. This organization is actually a CSA, located just a few miles outside of downtown Indianapolis. All of their produce is organically grown and it runs from April until November. Tagged as the largest gluten free health food store, Nature’s Pharm has two local stores, in Greenwood and Castleton. This specialty health food store distinguishes itself with highly trained staff that will assist you during your visit. It provides products which support alternative health practices. They also host various events and seminars, offer valuable coupons, and share tasty and healthy recipes. For more details, check out www.natures-pharm.com. 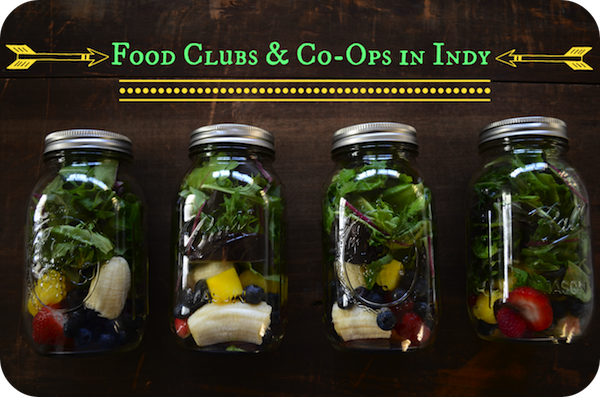 These are just some food co-ops in Indy. Most of the time, co-ops exist in cities or suburbs to cater to large target markets. However, since the demand for local and organic food has been increasing, more co-ops open in rural areas yearly. Try exploring your area and find the ones near you. Some Indy co-ops focus only on one specific type of food such as gourmet cheeses, dairy, or all-organic produce. However, the trick with co-ops is finding that one co-op store which provides all your needs in just one visit. This blog will again cite Pogues Run as a “Best of” in that category. So,the next time you’re out to get some groceries, why not try the nearest Indy co-op or CSA in yo ur area? Not only can you maintain a healthy lifestyle, but you can also help empower your local community.